We were sparked to start Shepherds Talk after teaching a weekend retreat that focused on spinning raw and natural. Inspired by exploring breeds and working with raw (or lightly washed fiber) unprocessed fiber, and playing with ways to keep the integrity of the fleece and ultimately use it in a finished project, we decided to continue on that path. We have gathered up many of our past videos (both from Dream Come True Farm, and The Yellowfarm) and are offering most of them here and also on the new Shepherds Talk YouTube channel. The focus as we move forward will be on continuing the exploration of working with fiber with a keen eye on highlighting the unique qualities of each. We are so excited to have started down this path and look forward to having you come with us. ​Pamela Blasko lives on a small farm in Oxford CT with her husband Mike, where they raise wool producing animals so that Pam can create fun and whimsical handspun yarns. The fleeces and raw fibers that the animals yield, she processes by hand, including washing, carding and dyeing, to insure that when she spins her yarns she is using only the finest materials. Pam’s favorite yarns to spin are art yarns with bold colors that are usually big and bulky, full of character and personality. She translates these fibers into knitted works of art. Pam also fashions felted art work, using both wet and needle felting techniques. In this way she creates one of a kind clothing items, boxes, rugs and framed wall art. Along with her spinning and felting, Pam is a spinning instructor. She has been teaching these techniques from her farm and throughout New England for 22 years. In 2007, she was invited by the Spanish government to spread her knowledge of the fiber arts throughout the village of Benalauria. 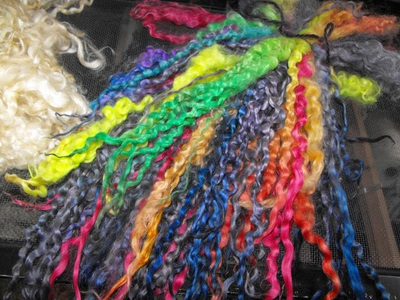 In 2012 Pam was asked to participate in Vogue Live in New York City, where she ran a successful booth and demonstrated fiber preparation to a large audiences. Pam has been featured on NPR, and the Black Sheep Yarn Shop where she introduced her Spinner’s Notebook that was created in 2001. This book is an essential for any fiber artist wanting to better understand the fiber breeds. 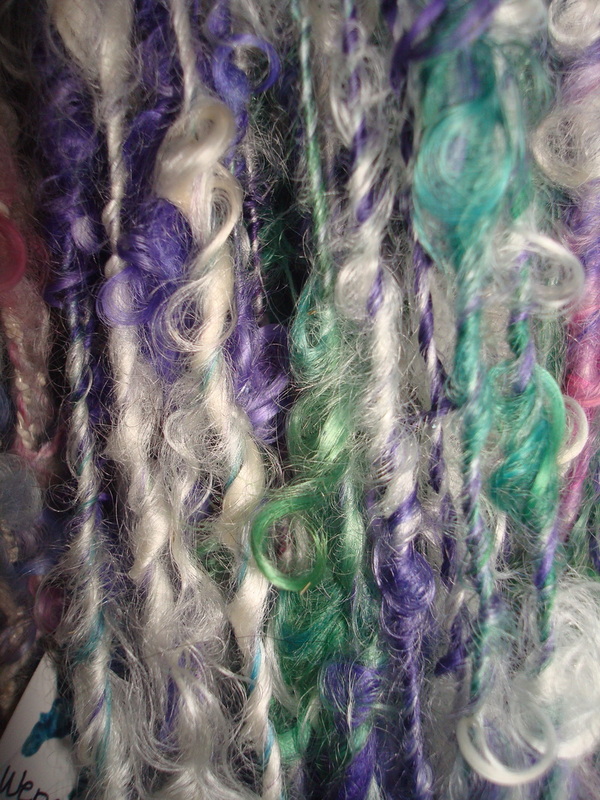 It includes uses for wool, actual samples, and suppliers. Pam also starred in an episode of Channel 8’s program on Women in the News. This past year has been a very busy one for Pam. The Oxford Cultural Arts Committee hosted a month long showing of her work at the town hall which received rave reviews. Spin Artiste, an international blogger on spinning, invited Pam to participate in its first fiber challenge, “Leather and Lace” and this exhibit is currently touring the Northeast. 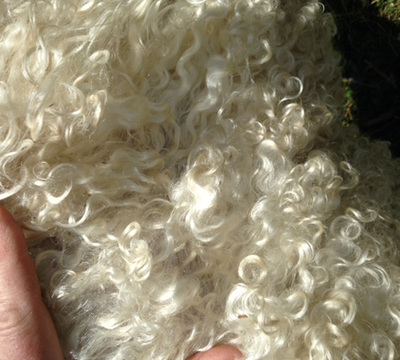 Hello, my name is Virgina and I breed registered Wensleydale and Teeswater luster long wool sheep. My husband Tom and I live and work the Yellowfarm in upstate New York. Our breeds are in the process of being established in this country and our stock are high percentage animals, bred to excel in the show ring with exceptional conformation, and shine in the fiber world with their breathtaking fiber. I have a passion for locks, especially lustrous, soft curly ones, and I simply adore our sheep. I have been spinning for about 15 years, and right now am completely infatuated with spinning textured yarns. Being able to work with the fiber that comes directly from our animals, keeping the integrity of the fiber itself, make me happy. Gaining inspiration from the fiber, challenges me to create finished pieces with the various textured yarns, and I love a challenge. 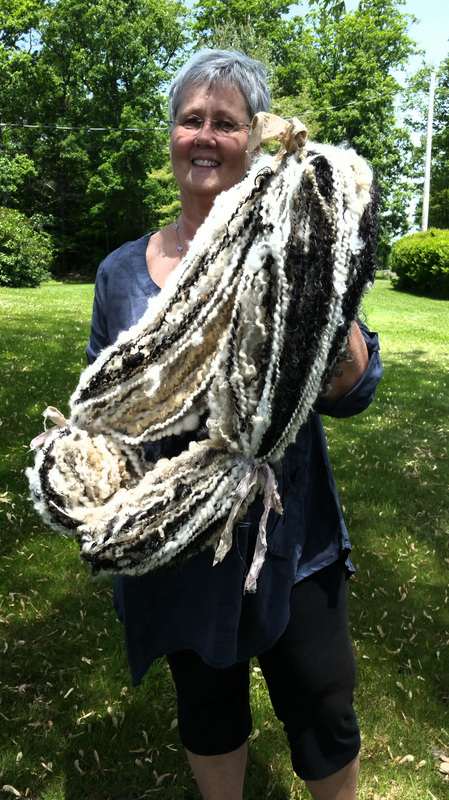 The farm keeps me very busy, but I 'do' a handful of fiber shows throughout the year, and can be found every October, at Rhinebeck (New York Sheep and Wool) showing my sheep.